Arsenal summer signing Stephan Lichtsteiner has responded to questions over his situation at the Emirates Stadium since his free transfer from Juventus. 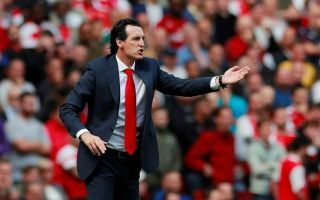 The Switzerland international is yet to start a match for the Gunners and has only been given one appearance from the bench by manager Unai Emery. Lichtsteiner shone at Juventus for a number of years and was a key player for them, and he admits now he’s not used to this reduced role for his club. Still going strong at international level, the 34-year-old insists he doesn’t feel he’s ready to retire, saying he’s in the physical condition of a 28-year-old. That has not, however, led to more playing time for Arsenal so far, though while Lichtsteiner has taken this opportunity to send the message that he’s fit and ready to play, he also concedes that part of the reason he came to north London was for the challenge of competing for his place with Hector Bellerin at right-back. ‘I could have changed to five other clubs in the summer, knowing that I would certainly play 47 out of 50 serious matches,’ he told Sportal, as translated by the Daily Mail. ‘I wanted to join a big club, I was looking for a demanding challenge in a new league. ‘That’s why I knew from the very beginning at Arsenal that I had to fight for the regular spot against Hector Bellerin. ‘For me, stepping down has never been up for debate, if I have to admit that I cannot keep the level of the last few years, then it is time. ‘But then I will not only resign from the Swiss national team, but finish my career. ‘If you have achieved a lot in your career, you have high expectations of yourself and want to play- but I also know that I will get the chance to play games. It remains to be seen if Arsenal can find a place for Lichtsteiner any time soon, though he’s certainly a decent option to have as a backup in case Bellerin picks up an injury.